Apple has been in the education market for years. Back in the 90s when Apple was approaching bankruptcy, they were giving them away to schools to get the word out, and have the kids get used to using Macintosh software. To get more schools to buy Apple computers, Apple has silently released an “education only” iMac with trimmed down and slower hardware. Only available to students and faculty using Apple’s Education Online Store, this new iMac costs $999, and has a 3.1GHz Intel Core i3 Dual-Core, 2 GB of RAM, 250 GB hard drive and an AMD Radeon HD 6750 with 256 MB. 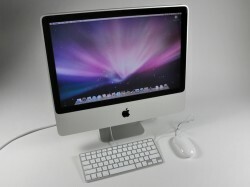 Compared to the low-end regular iMac, which comes with a 2.5GHz Quad-Core Intel Core i5, 4GB of RAM, 500GB hard drive and an AMD Radeon HD 6750M with 512MB. Considering the price difference being $200, this isn’t as great of a deal as Apple has done in the past with their iMac G3 being $799 to schools. Laptops sell more than Desktops do today, so it would have made sense for Apple to sell a slower MacBook Air or MacBook Pro at $200 cheaper than the low-end products are. More people would want to have a mobile form factor over a one-spot computer, even when the iMac is light enough to travel with. So will this cheap iMac be popular? Most likely, no. If a district or student were to get new computers, they might as well go mobile by getting either iPads or MacBooks, but if a Desktop is what the user needs, it will sell fine.